On this page we present the messages written on the backs of the historic beauty postcards in the Museum's collections. Most of the cards were posted in China or from one of the foreign missions operating in China in the late 19th century and early 20th century. Many are from the time before the fall of Imperial rule and the founding of the Republic of China in 1911. The postcards were sent all over the world - England, the USA, Germany, France, Holland, South Africa and Japan. The messages are often very simple - a "thank you" for a gift or letter received. Occasionally they tell a more personal story - a letter to children back in England or America from a loving father far away. Many of the earliest postcards were sent by soldiers serving their countries in China and these postcards were sent free of charge with dispatches and are without postage stamps. Postcards sent by mail are sometimes marked "via Siberia" and will have travelled overland from Vladivostok to Moscow on the Trans Siberian Railway, and thence on to Europe. The postcards come from a time when the world was much, much larger than it is today. Air travel was undreamed of. And China was a land of mystery and imagination. 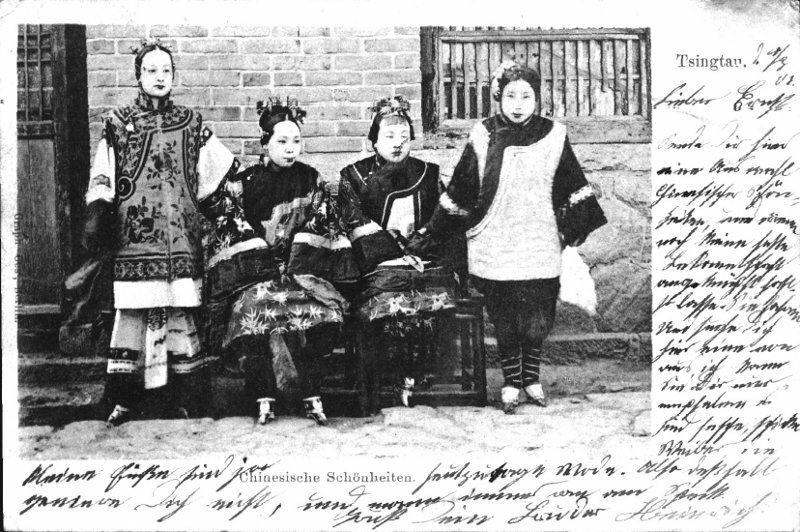 This postcard of "Chinese beauties" was posted from Tsingtau in China to Dortmund in Germany in 1901. The handwriting is very difficult to read now but it tells an interesting story.